The European R&D project RenewIT studied energy concepts for renewable energy supply of data centres. The project partners from Spain, Italy, UK, Germany and The Netherlands looked at 18 different energy models. 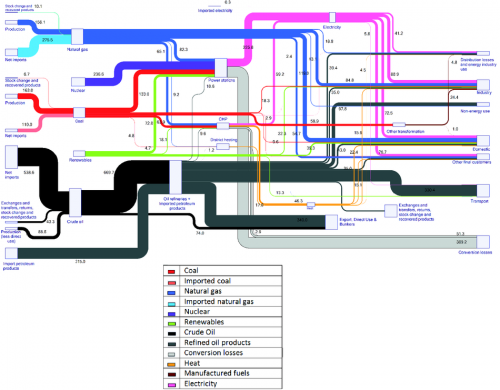 In the final project report each of the concepts are described, accompanied by a Sankey diagram. 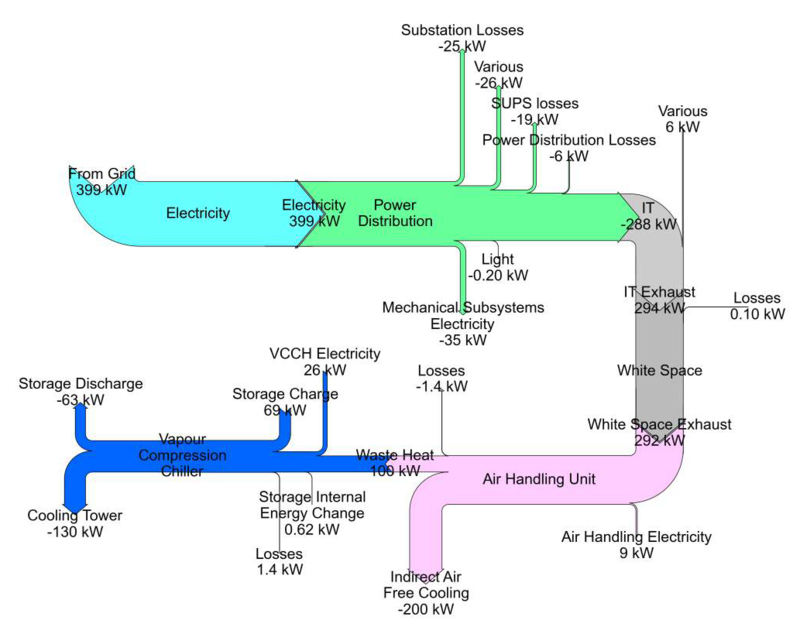 The above is figure 3.53 from p. 177 of the report showing the “Sankey chart for the distribution of average energy flows per year within different subsystems of concept 7 for scenario 3”. Sweden is administratively organized in 21 counties, called “Sveriges län”. A new report ‘Energistatistik för Sveriges län och kommuner för år 2013’ (Energy Statistics for Swedish Counties and Municipalities on the year 2013), published by Länsstyrelsernas Energi- och Klimatsamordning (LEKS) features energy flow Sankey diagrams for all counties. All flows in GWh per year. Percentage breakdown for contribution of fuels (left side) and for consumption (right side). 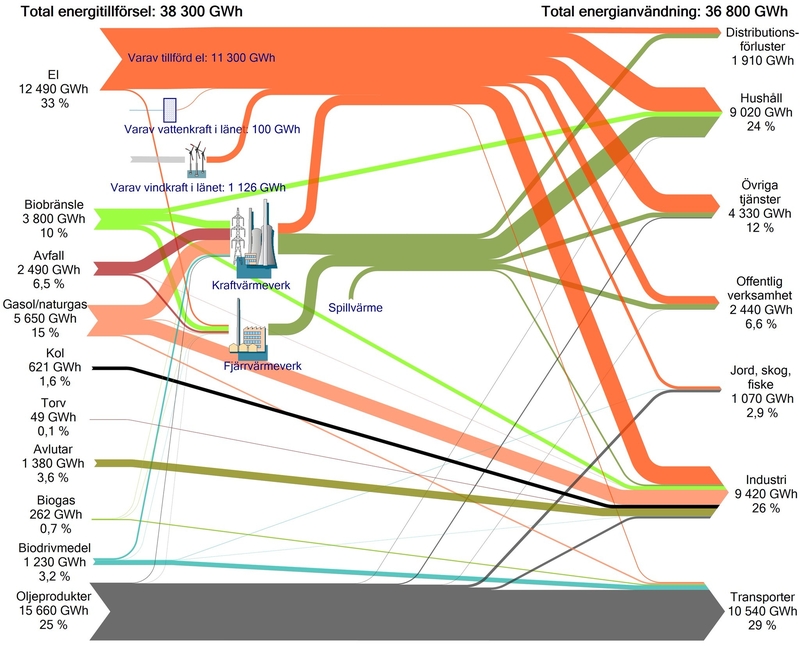 Actually the energy picture looks quite differently in some counties: For example, Södermanlands län (on page 19) has 33% coal/coke (‘Kol/Koks’). Kronobergs län’s most important energy source with a share of 29% is biomass (‘Biobränsle’). 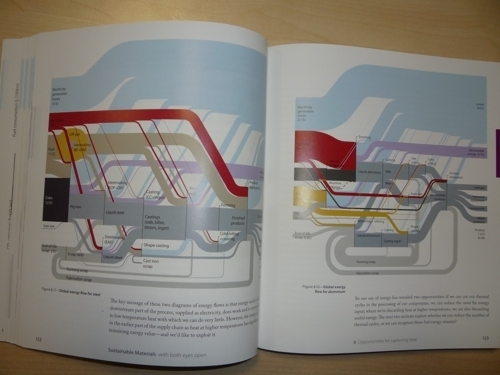 Twenty-one wonderful Sankey diagrams … a sheer joy for a Sankey fan like me. 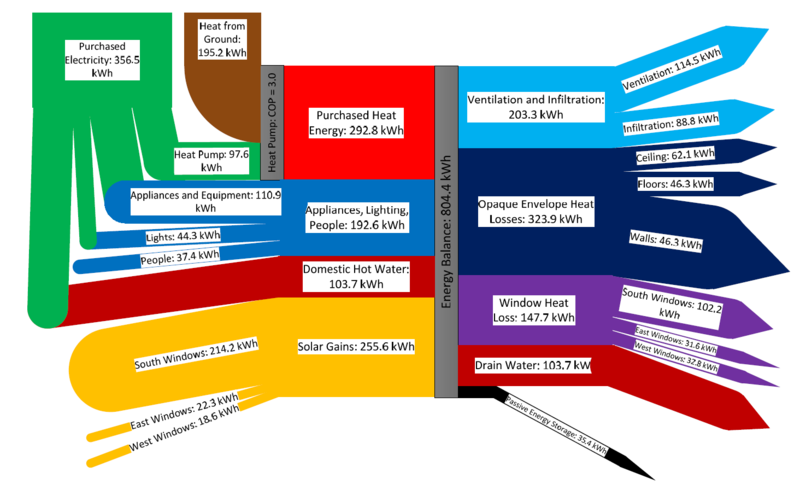 Regular readers of this blog have seen the national energy flow diagrams (energy balances) before. I have featured them from many different countries already. 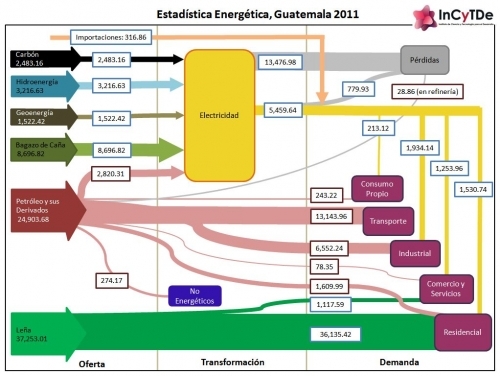 I finally came across a similar Sankey diagram the energy flows of Europe for 2010. It is featured on the European Energy Agency (EEA) website in a report titled ‘Overview of the European energy system (ENER 036) – Assessment published Mar 2013’. 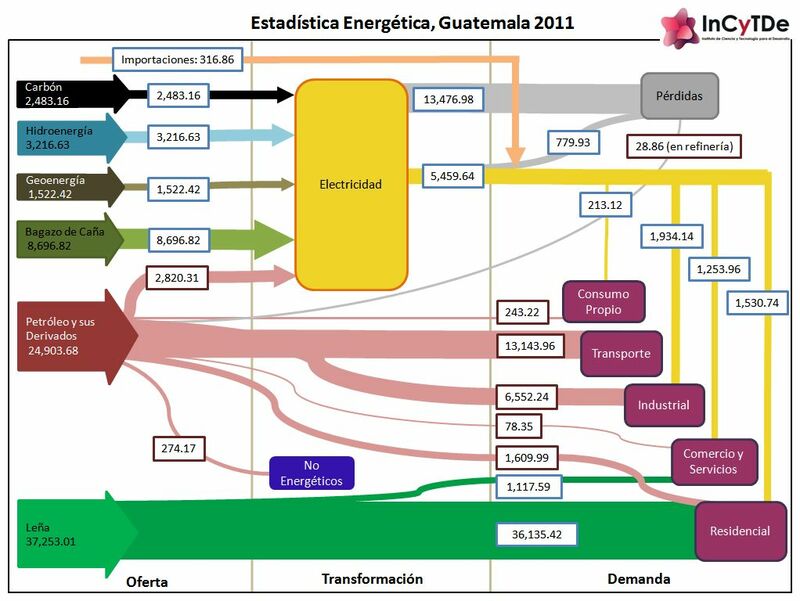 “The figure is a Sankey diagram which shows the composition of the primary energy entering the energy system of the EU-27 in 2010, and where this primary energy was used, either as losses or as consumption by specific sectors of the economy”. It is based on EUROSTAT data for the EU-27 countries. A legend is available below for the coloured arrows. The diagram is extensively explained and commented on the web page. The content on the source page has been removed, because there is an updated version. In addition to what we have seen in such diagrams, the primary energy (fuels) is further differentiated with two separate input flows whether the energy carrier was imported or is from domestic European production. This is to visualize dependency on imports. Following up to my Aug 25, 2011 post on Global Steel and Aluminium Flows, I would like to recommend the follwing book that has just been released: Sustainable Materials – with Both Eyes Open: Future Buildings, Vehicles, Products and Equipment – Made Efficiently and Made with Less New Material by Julian M. Allwood and Jonathan M. Cullen. I’m hardly a hundred pages into reading, but I already love it. The book is very graphical (to say the least), well illustrated, with many graphs and photos, infographics and even historic images. 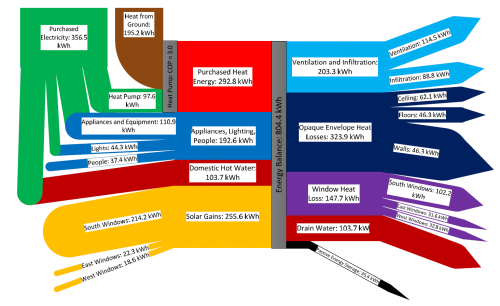 Plus – and this is why it deserves to be presented here on the blog – it features a great number of Sankey diagrams. I really enjoy the lego bricks in the steel making flow chart (pp. 121-127). You’re also going to love the ‘WhatsApp’-style chat between Henry Ford and the Wright Brothers (p. 181). Sustainable Materials with Open Eyes by Julian M. Allwood and Jonathan M. Cullen can obtained from Amazon and – I am pretty much sure – from your local book dealer. Here is the book’s website. 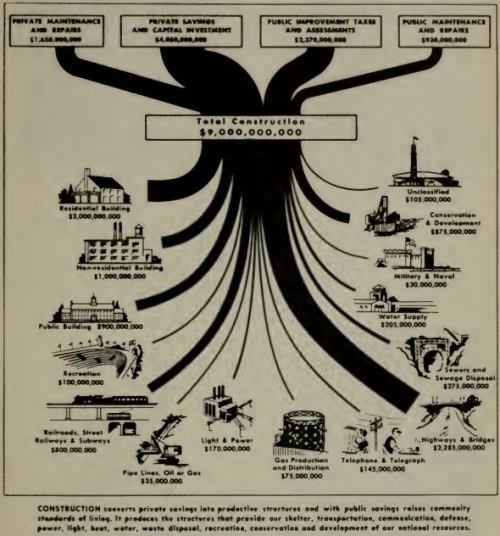 This post on the Visual Think Map blog (new addition to my blogroll) guided me to the fantastic 1939 book ‘Graphic Presentation’ by Willard C. Brinton. It is available in full as a PDF on archive.org. Chapter 8 (pp. 73 to 80) deals with “Flow Charts”, and has the above Sankey diagram on sources of funds and spendings in construction. The chapter has an emphasis on ‘Cosmographs’ (a brand name of a at that time, apparently by IBM) and how they are made. I will dedicate one of the next blog posts to cosmographs I think. In the meantime, enjoy browsing Brinton’s book.